Fog light with black housing, bracket with long holes for upper or bottom mounting, lens 60 x 36 mm, lens with frame 63 x 39 mm, total depth 65 mm. 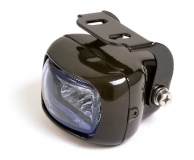 FOG light with black Alu housing with bracket, lens blue, B x H x T = 78 x 52 x 78 mm. 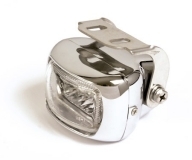 FOG light with chromed Alu housing with bracket, lens clear, B x H x T = 78 x 52 x 78 mm. 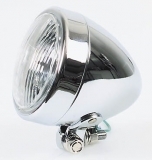 Headlamp BULLET, 90mm H4, chromed, bottom Mount. 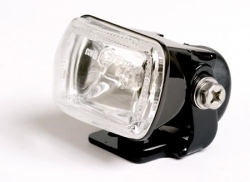 High Beam lamp with clear lens, chromed housing with visor, bottom mount, homologated, H3 12V/55W. Housing diameter approx. 108 mm, depth approx. 85 mm.